If Moose were a man, he would write me love letters and bring me breakfast in bed. If Moose were a man, he would hold my hand and kiss me every chance he got. If Moose were a man, he would love me for who I am, not for who he wanted me to be and not for who I wanted to be. But….Moose is not a man. He is my dog. He is very soft. He can curl up on my pillow in a single pile. He can lick my hand until I fall asleep. He can gulp raw chicken in one swallow. These are all qualities love in my Moose but might not like so much in a man. But the other things that my Moose has to offer would be invaluable in a man. Moose and I share the same pillow. He takes up most of it and I get a corner. But he stays in his spot all night. If he were a man, he would be capable of spooning for most of the night regardless of whether his arm fell asleep. Moose is an agility dog, trained to the highest level. If Moose were a man he would take directions from me and proceed to fulfill them with no questions asked. He does not argue with me when I tell him to ‘go tunnel’. He doesn’t bark at me when I tell him to ‘down’ before he eats his dinner. Moose goes everywhere with me. He will go on walks, hang out at the coffee shop, visit my parents, and swim at the lake. He doesn’t care about the destination, as long as he is with me. If Moose were a man, he would go shopping with me, even to super Wal-Mart. He would be on time and jump in the car with no questions asked. Moose protects me from strangers; even if he is only 11” at the shoulder, and 28 pounds. He can bark, whine, and snap as well as any Schutzhund-trained shepherd. If Moose were a man he would stand between me and all evils. He would fight tooth and nail if any harm were to come my way. Moose can sense my mood at all times. He can hang out and be quiet while I grade papers or he can jump around the room chasing flies while Metallica blares from the stereo. If he were a man, he would know when to deliver chocolate, he would see my need for silence in the morning, and he would sing along when YMCA played on the radio. Occasionally I kiss Moose on the nose and pause, waiting to see if he springs into a man. He would be tall with brown hair and a goatee. A twinkle in his eyes would tell me everything I need to know and we would be off, holding hands into the sunset. But…Moose is not a man. He is my dog. So, I pat him on the head and he licks my hand. Maybe he wishes I was a dog. 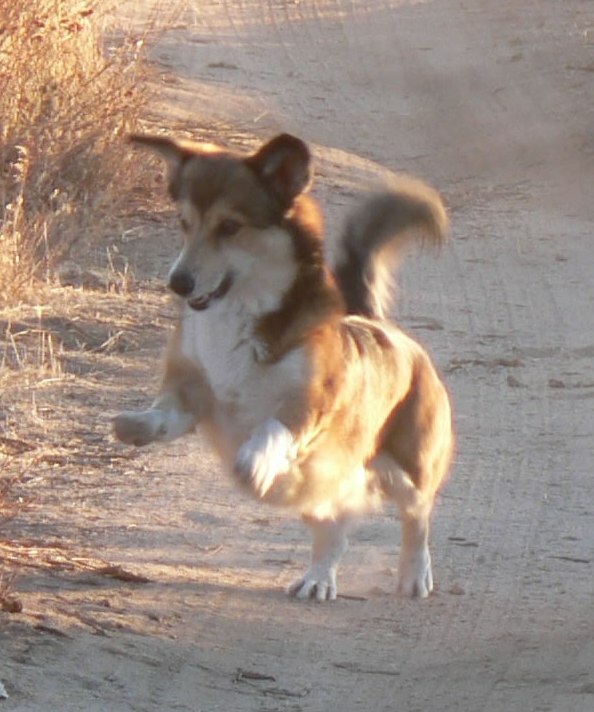 This entry was posted in Dog Fiction and tagged corgi, corgi short story, dog fiction, dog flash fiction, dog short story by ffluffy. Bookmark the permalink. Love this!! If my Rudy were a man…..